No real reason for the opening picture. 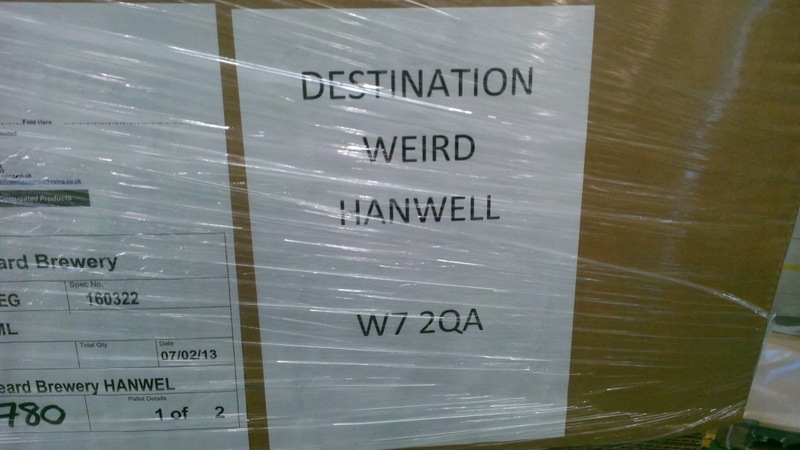 Except it made us chuckle when we saw it, although not sure how the people of Hanwell would have felt seeing 'Destination weird Hanwell' pass through on the back of a truck. And maybe to pad out a blog about a moderately uneventful week. One of the main reasons the brewery has been a little quiet over the last couple of weeks, besides me being busy with my 'day job', is our naughty little creation Holly Hoppin' Hell. 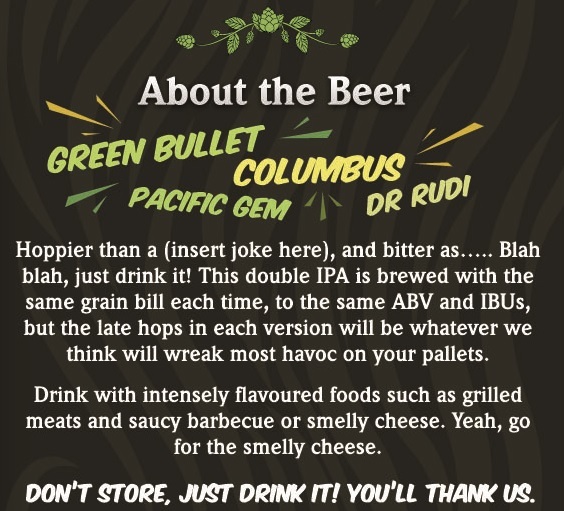 Not sure we can blame the beer itself for everything, I think the weather has played it's part, but this brew has not gone as smoothly as we would have liked. But it's finally been package, the label design is finished, Labels ordered and we hope to get bottles out the door in a couple of weeks. 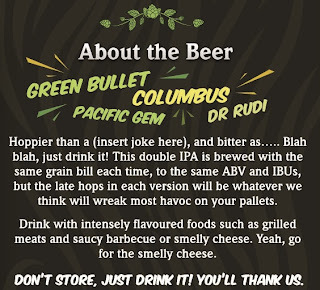 I love the label for this beer, a sneak peak can be seen above, but we will unveil the full label and full details of the beer and brewing process in the beers blog in a week or so. The worst part of packaging days is the cleaning. Sticking beer into 4 casks, 18 key kegs and 2300 bottles doesn't happen quickly, even with the tireless assistance of Andy Parker. After standing for around 9 hours straight, the last thing you want to do is attack and clean an empty fermentation vessel. 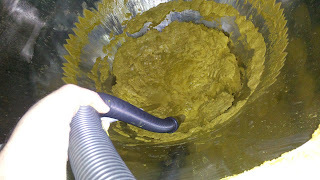 Holly Hoppin' Hell was a particularly messy son of a.... Coming in at 8.5% and with 15.5Kg of dry hops, there was a lot of crap in the cone of that vessel.Usually we would open the valve at the base of the cone and let the waste run out, but this time it was so thick and abundant, we had to get in with our new industrial size wet n' dry vacuum. 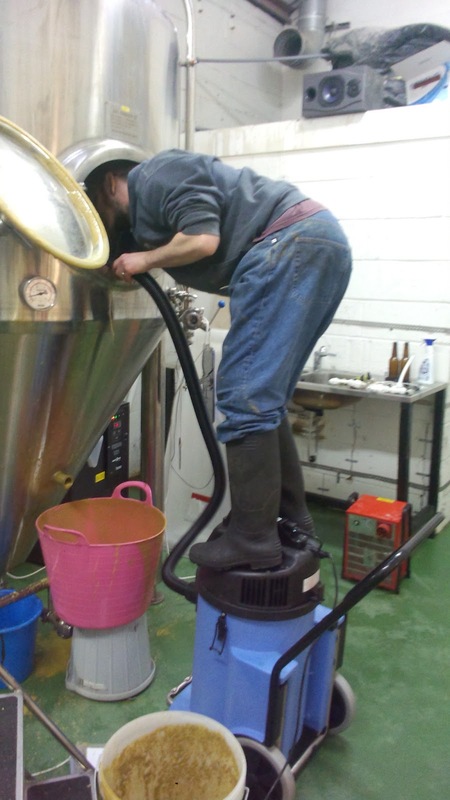 Now we could leave the cleaning of the FV until the next day, and we often leave part of the clean up for the following day, but you need to get the bulk of it done, otherwise it is all just going to dry up and be so much harder the next day. It was particulary important this time round for two reasons. Firstly, it was a Friday, and no one was really available on Saturday to come in and clean. But most importantly, and we are very excited to anounce this, with more information to follow, on Monday we will be doing our first collaborative brew in the brewery. This will not be just any old collaboration, this will be an international collaboration with our good friend Ingemar Jansson from Swedish cuckoo brewery Sad Robot coming over. I believe Ingemar has the obligatory facial hair, unless he has shave since last we saw him. This brew will be the first of hopefully 3 saisons over the coming months. Beer continues to fly out the door, with bottles of Miss the Lights and Black Perle starting to run low. We are in a number of bottle shops around the country, and can be brought on-line now from Ales by mail, although they had pretty much run out of stock at time of writing. But they are picking up more next week. This leads me on to a kind of apology. We are trying to keep the Outlets page on our website as up to date as possible, but this is proving difficult. There are several reasons for this. I would like to say the main reason is because we are selling to just too many people that we can't update quick enough. We are struggling to keep up, but this is not the main reason. We are now supplying a number of distributors, especially north of London, so we cant always know exactly who is buying from these distributors. As we hear about beer appearing, we try and update, but we need to keep our ear to the ground. We also supply a number of products to each bar we deal directly with, and it is impossible to know when each beer is going to be on. So if you guys see or hear of our beer anywhere, please do help us out by tweeting about it. Maybe we should come up with a hashtag. 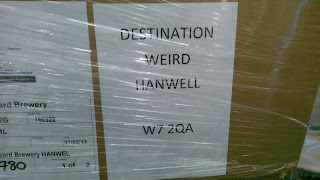 All opinions and grammatical errors are those of @WeirdBeardBryan, and not always the grand circle of bearded brewers.